A click is the band’s time keeper. Like a metronome. Yes the drummer should be keeping time, but he’s human and will speed up and slow down. That’s a given. Generally choruses are sped up and verse slowed down. We all do that. A click allows a band to start in time (without having the drummer count you in on the hi-hat or his sticks) and helps you continue playing the rest of the song in time. It’s my birthday in exactly 6 weeks time, so if you’re looking for any ideas on what to get me, here is one. 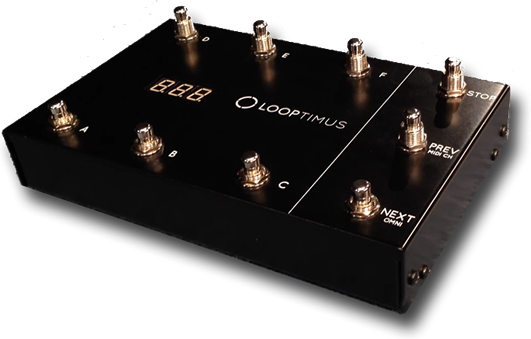 It’s called the Looptimus pedal. Basically it’s a USB powered MIDI foot controller for Ableton Live, MainStage, Reason and more. I’ve been using Ableton for a few months now to fire clicks and loops via my Macbook but it can be clumsy. This pedal allows you to do the same (and more) using your feet.